Satisfy your pizza cravings and your craving for savings with a discounted gift card to California Pizza Kitchen! They offers California-American cuisine and specializes in unique pizza combinations. Buy California Pizza Kitchen gift cards to save on fine dining in a relaxed setting. Enjoy their fresh and innovative California-style pizzas today. California Pizza Kitchen gift cards are great gifts for moms and families. Shopping Tips: California Pizza Kitchen gift cards do not expire and have no additional fees. Below is a listing of our favorite places to buy California Pizza Kitchen gift cards. There are always great deals and discount available when buying these so check back often. We will keep this list updated to reflect the best rates when possible. 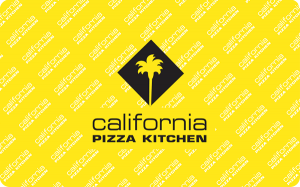 Get cheap gift cards today to enjoy delicious pizza, pasta, and many other tasty items from California Pizza Kitchen! If you’re in the mood for mouth-watering dishes of all varieties, then this is the gift card for you, so pick yours up today! Read more on Gift Cards Discount Rates.